The HP Chromebook 14 (and newer chromebooks in general) features a "legacy boot" mode that makes it easy to boot Linux and other operating systems. The legacy boot mode is provided by the SeaBIOS payload of coreboot. SeaBIOS behaves like a traditional BIOS that boots into the GPT of a disk, and from there into your standard bootloaders like Syslinux and GRUB. Go to the Chromebook page, read the Introduction and continue by following the Installation guide. For information on general Chromebook post installation configuration (hotkeys, power key handling ...) see Post installation configuration on the Chromebook page. Add the Xorg touchpad configuration below for better usability (higher sensitivity). Reboot for the touchpad to become operational. We will create a custom hwdb config file to bypass the default mapping in /usr/lib/udev/hwdb.d/60-keyboard.hwdb of the keys between escape and power so they will work as F1-F10 and the search button as Super_L/Mod4. Add the following to the new hwdb config file, save and exit. Reboot to load the updated hwdb database. After each upgrade of Systemd, its installation script will rebuild the database automatically so we don't need to take care of it. See Map scancodes to keycodes for more details. This article or section is a candidate for merging with Chrome OS devices. Once you've applied the above fix you can set the function and arrow keys to act similar to how they are in ChromeOS using a modifer key. The example below uses Mod4 (Search on the chromebook's keyboard). This can be changed to Control or Alt if you prefer. First make sure you have all the needed packages: xbindkeys, xorg-xbacklight, alsa-utils, xvkbdAUR, xdotool. to your .xinitrc, or whatever your DE uses for startup. Warning: There are 4 hidden screws under rubber stubs (not the rubber feet) at the bottom. Remove the visible screws and another 4 hidden screws under rubber stubs (not the rubber feet) at the bottom. Flip the laptop right side up and use a thin blunt object to pry the keyboard surface from the bottom half. The bios screw is located to the left of the fan, it can be recognized by the fact that the copper circle it sits on is split in half "( )" vs "O". The screw connects the two halves, making the bios unwriteable. Once this screw is removed, it's advisable to unplug the battery and plug it back in to ensure that the removal is recognized. 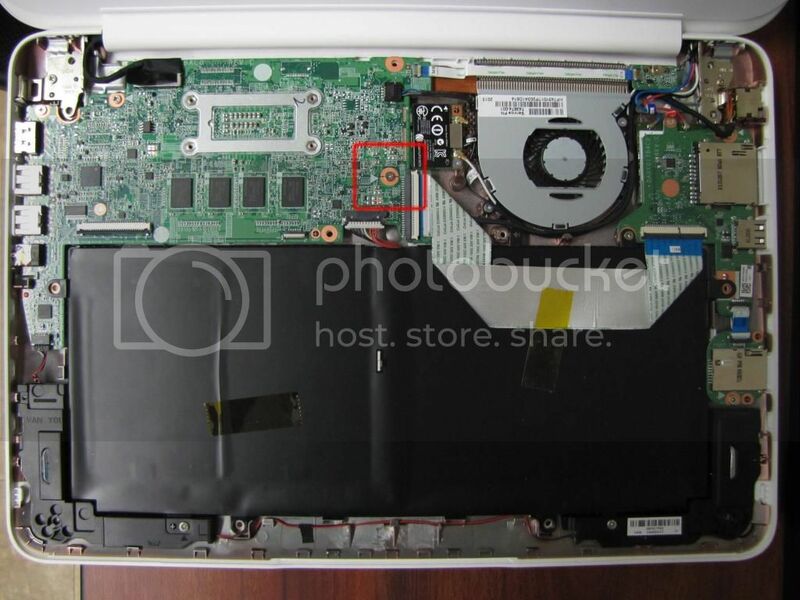 See disassembly pictures ,  and the location of the write-protect screw. This page was last edited on 13 January 2018, at 07:45.